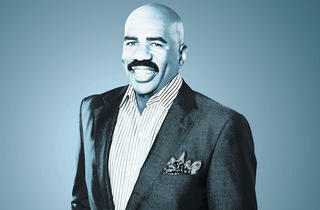 Harvey says bye to stand-up, hello to a new talk show. Have you and your family found a house here? My wife is in Chicago right now, decorating. Uh-uh. [Laughs] I like the way you tried it, though! Buddy, I’d have people outside my door soon as I get there with red velvet cakes. I know a lotta people in Chicago. They’ll discover it sooner or later. Let’s just say it’s in a high-rise, downtown Chicago. A penthouse somewhere. The Facebook page inviting potential guests to your show asks questions like, “Worried about the guy your daughter’s dating? Do you want Steve to check him out for you?” So you’ll be a kind of Dr. Phil, giving out advice? I’m not a doctor. I just have a tremendous amount of common sense. There’s a lot more to me than just funny. I’ve had multiple marriages, I have a blended family, I have been a great father, I have messed up in fatherhood. I’m a great husband now, but I’ve been a bad one in the past. I have daughters that range from 29 down to 15. I’ve got sons that go from 14 to 21. I’ve been married, been homeless, divorced, good credit, bad credit. Between 30 and 33 years old. I was with my first wife. We were on the ropes and I left Cleveland and I didn’t have anywhere to go, so I was living in a [Ford] Tempo for three years. Every now and then I’d earn some money and could get a hotel room, like a Motel 6, but most of the money I sent back to my ex-wife and kids, so that caused me to live in a lotta parking lots and stay at a lotta rest areas. When did you mess up in fatherhood? When I was homeless, I couldn’t provide much at all for my twin daughters. I wasn’t making a lotta money as a stand-up. And then I wasn’t there for them, which is even bigger than the finances. That burns in me today to be the father that I am now. With your books and now the talk show, you’ve made a shift from comedian to motivational speaker. What prompted that? So you’ve also become more religious. How did that happen? I was sick of me. I didn’t have a great relationship with God. I was making all the decisions myself. And in doing that, man, I was messing up. I was marrying who I wanted to marry, without confiding in him. I was like that song “The Tears of a Clown.” Everybody see me laughing on the outside, but in my hotel room I was miserable. In your book Act Like a Lady, Think Like a Man, why do you place the responsibility on women to understand men? Why not ask men to act like a man, think like a lady? A lotta women have asked me, “Steve, why is the onus of the relationship on the woman?” Well, it don’t have to be. But if you’re trying to understand how your man thinks, let me let you in on a little something: Here’s what we think about love, relationship, commitment. And it was so factual and true, I didn’t even get flak from men. I didn’t write a Bible. I just wrote a book. You can call it outdated, but there are some things in a relationship that’s gonna last throughout the end of time: Boy meets girl, they say they fall in love, and then here’s the rest of it. So I’m really cool with the criticism. But don’t buy the book, lady. It’s okay. Your own parents were married for 64 years. What did you learn from their example? My father was a coal miner in West Virginia and a construction worker in Cleveland, Ohio. The three months of winter he was out of work, and my father booked numbers. It was illegal, but it fed us. My paper route was I went to people’s houses to not only deliver the papers but I would pick up all of the numbers, and if somebody hit, he made 10 percent. And that’s how we ate. My mother was a Sunday school teacher for 40 years, so my mother always raised me with faith. My father’s conversation was: Work hard, do what you say you gonna do, and don’t be afraid of another human being. 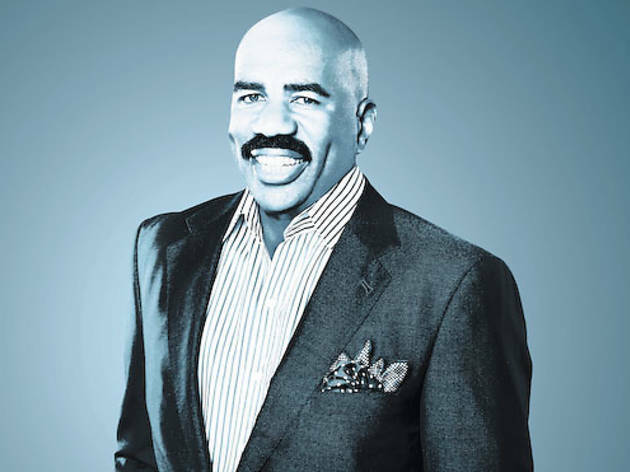 Steve Harvey plays the Civic Opera House July 28 at 8pm.